Front Suspension Sachs Ø43 mm upside-down front fork with fully adjustable compression and rebound damping and spring preload. Rear Suspension Sachs hydraulic shock absorber with adjustable rebound and preload. Front Brakes 2x Ø320 mm stainless steel floating discs. Brembo four-piston radial callipers. Metal braided brake hoses. Rear Brakes Single Ø240 mm stainless steel disc. Single piston Brembo caliper. Metal braided brake hose. Continental two channel ABS system and Aprilia Traction Control (ATC). Wheels Lightweight aluminium alloy with three split spokes. The Aprilia Caponord 1200 is powered by a 90-degree 1200cc liquid-cooled fuel-injected DOHC 8-valve V-twin that produces 128 horsepower and 116Nm of torque. it’s packed with electronics – selectable engine mapping (sport, touring, raing) and ride-by-wire throttle for smooth, consistent power delivery. The engine is mated to a six-speed gearbox, operated via a hydraulic clutch. The Caponord 1200’s chassis uses a mix of steel tubes and forged aluminium plates for lightness and strength, the ergonomics are optimized for long-distance riding over all kinds of terrain, the windshield is height-adjustable and the Capo’s 24-litre fuel tank means a range of more than 300km on one full tank of fuel. 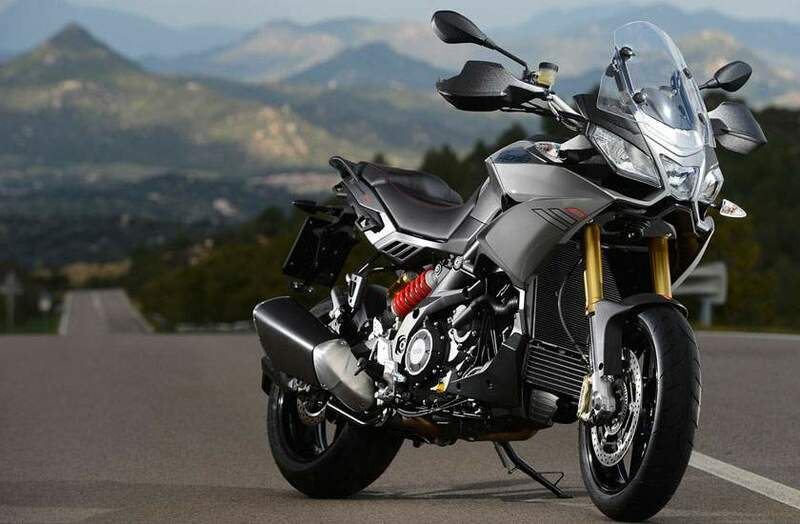 The bike also has 29-litre panniers that can be mounted at the back, on the sides, and according to Aprilia, these do not create any inconvenience for the rear seat passenger. And the exhaust silencers are height-adjustable, so you can alter their height when you aren’t riding with panniers, making sure your bike looks. As the Adventure Touring segment continues to evolve, so does the technology in each motorcycle company’s perspective machines. 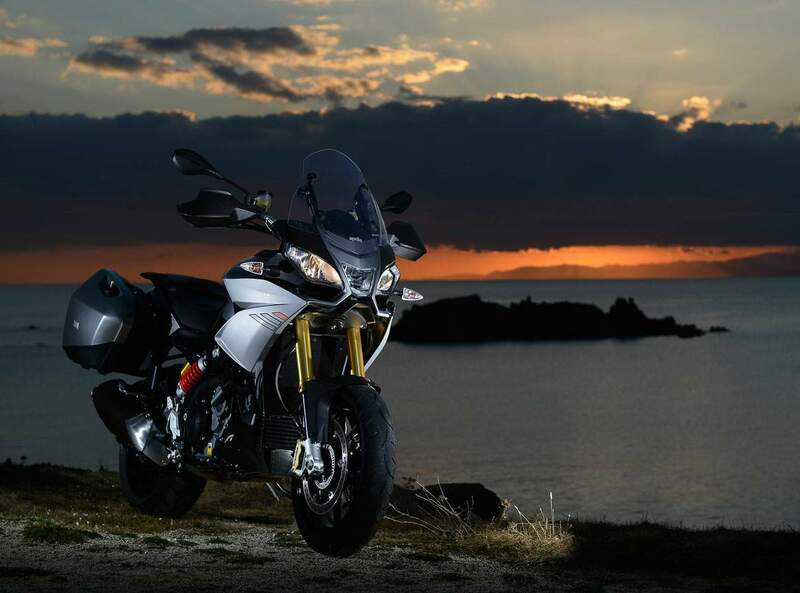 This is especially true in Europe, where many manufacturers offered a bit more on their 2013 Adventure models – the restyled BMW R1200GS, the all-new KTM 1190 Adventure, the Ducati Multistrada 1200 and its new Gran Turismo model, and the Triumph Tiger Explorer in a more off-road worthy XC version. 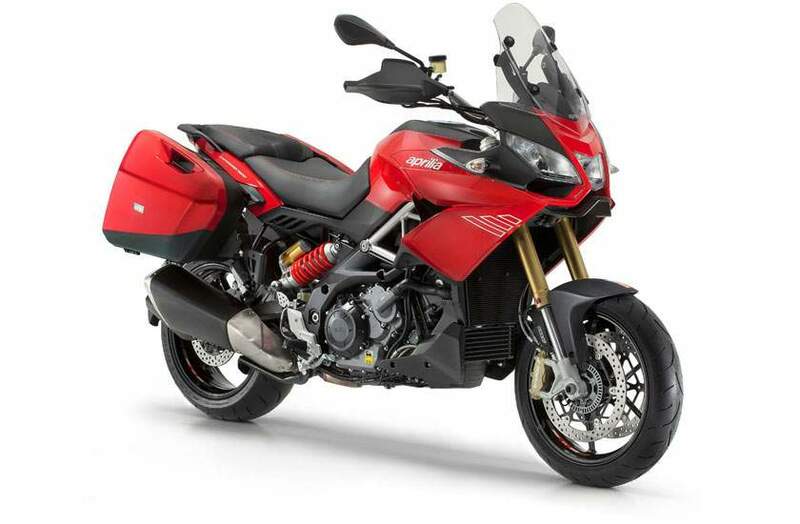 Not to be left behind, Aprilia has updated its former Caponord EVT1000 with a more competitive adventure model – the Caponord 1200. The 2013 chain-driven machine, which was teased in March at the Piaggio dealer meeting, uses the Dorsoduro’s 1197cc 90-degree V-Twin engine, though recalibrated for better road manners, and is highlighted with the latest slick technology, including triple mapping Ride-By-Wire, traction control (ATC), ABS and, with the Touring Package, Aprilia Dynamic Damping (ADD), which is a semi-active suspension system, and cruise control. Speaking of the 2013 Caponord 1200, Aprilia says "introducing Caponord 1200, the perfect bike for any occasion. Easy to handle and agile in the city, thanks to its advanced and lightweight chassis, quick and fun in the countryside, thanks to its sophisticated electronic management and its generous twin cylinder engine, comfortable for rider and passenger in touring due to the particular attention to ergonomic detail and its excellent protection against the air, thanks to wind tunnel shape studies." The Caponord’s 1197cc, 90-degree V-Twin engine was designed after intensive study of internal fluid dynamics, the tests aimed at "improving combustion, decreasing friction and maximizing performance." Aprilia’s engine, which features 128 horsepower @ 8500 rpm, and 85 ft. lbs. of torque at 6500 rpm, features an oversquare bore/stroke design, which gives it more grunt in the lower rpm range. 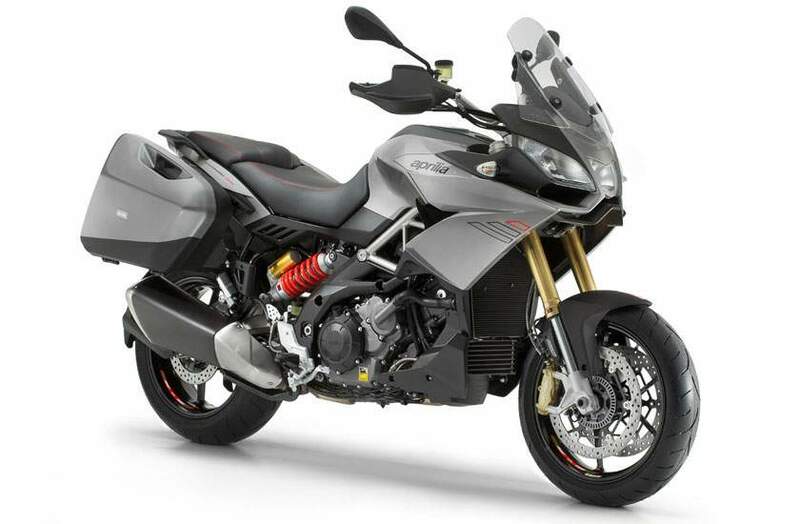 With that much power, the Aprilia will be on top of the horspower race in the adventure class, with the exception of the 150-horespower Ducati Multistrada. The engine arrives with offset cylinders for maximum lateral compactness, double-overhead camshafts driven by a mixed chain/gear valve timing system and four valves per cylinder. Also included on the motor is a twin spark ignition, speed density type electronic fuel injection with two throttle bodies and micro-nebuliser injectors, stick-coils integrated in spark plug boots , a three-way catalytic converter with double oxygen sensor and a hydraulically operated clutch. To assist with powering various electronics, the Aprilia Caponord 1200 features a more powerful 690W alternator. First introduced on the 2007 Shiver 750, Aprilia’s Ride by Wire (RbW) system helps achieve smooth throttle throughout the rpm range, all while optimizing fuel economy. The Caponord 1200 RbW features three maps – Sport, Touring, Rain – which can be selected on the fly by simply closing the throttle and selecting a map. Sport: maximum performance with responsive and direct power output in order to satisfy an aggressive riding style. Also standard equipment on all 2013 Aprilia Caponord models is a two-channel ABS system, and ATC (Aprilia Traction Control), the "exclusive traction control system derived from the Aprilia Performance Ride Control (APRC) system on the extraordinary RSV4, designed and fine tuned by Aprilia to get maximum grip out of any type of surface, able to give the rider great riding confidence, simultaneously increasing safety." Level 1: for a pure sport riding experience, all fun and adrenaline. Level 2: suitable for the city and touring and in general to manage the engine’s great power on any route. The Travel Pack provides further electronics, including Cruise Control and the ADD. Speaking of the Dynamic Damping system, Aprilia says the "brand new semi-active dynamic suspension system developed by Aprilia and patent protected. "The system measures the energy transmitted to the vehicle by the harshness of the asphalt, recognizes the riding phases (acceleration, deceleration, braking, constant throttle) and adapts the suspension calibration in order to maximise comfort and maintain the bike’s balance. All of this is possible thanks to the exclusive patented method which combines the principles of the skyhook and acceleration driven damping algorithms – well known in the motoring world – allowing maximum performance to be achieved across the entire fork and shock absorber frequency range. "In the electromechanical calibration suspension systems already available on the market, the rider presses a button on the handlebar to activate an electric motor which changes the suspension set- up. In the Aprilia ADD dynamic semi-active suspension system, on the other hand, all the rider has to do is ride." The Caponord 1200 also features a new digital instrument panel, the LCD combing a speedometer, rev counter, total and two trip odometers, fuel level and coolant temperature. There is also a selected mapping indicator (S,T,R) as well as the shock absorber electric spring preload indicator (where available). The engaged gear is also indicated, as well as the ATC level adjustment and heated handgrip operation (available as a separate option). The series of warning lights on the side include the fuel reserve, ABS and ATC engaged/disengaged and Cruse Control (where available), Aprilia says. The Caponord’s frame is based on the Dorsoduro 1200′s, but is modified for adventure touring duties. 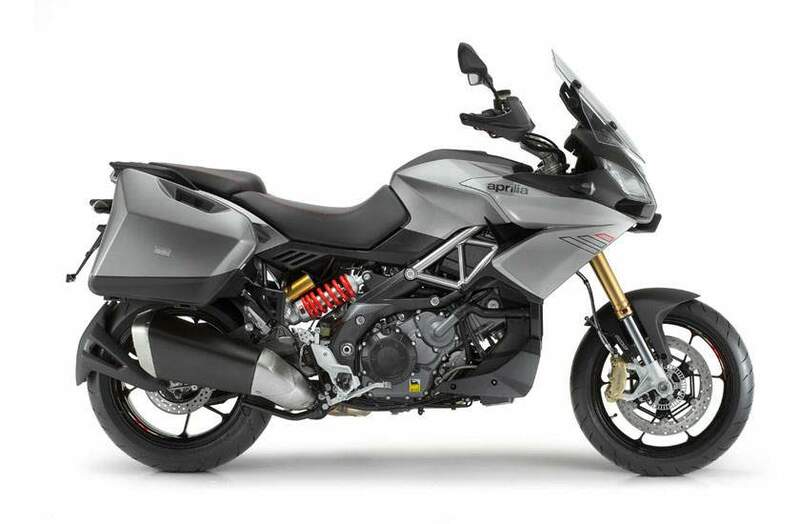 Aprilia says the layout of the frame is still a mixed structure, made up of a trellis in high resistance steel tubes connected to a pair of die cast aluminum plates. The Caponord features a new rear subframe, and a laterally-positioned rear shock absorber with spring preload and rebound adjustability. The 43mm front fork features adjustable spring preload, compression and rebound. The new Aprilia rolls on lightweight aluminum 17-inch wheels, which take design cues from the RSV4, and uses a Brembo braking system (two 320mm discs squeezed by four-piston monoblock calipers up front, and a 240mm disc squeezed by a single-piston floating caliper out back. 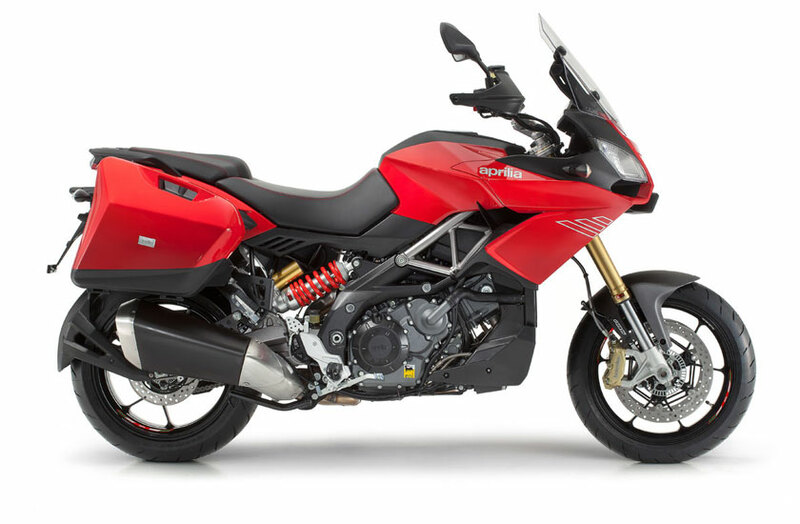 The Aprilia Caponord 1200 is further outfitted for adventure touring with upright ergonomics, an adjustable windscreen, fairings designed for better aerodynamics and wind protection, standard handguards, a 33-inch seat height, and a 6.3-gallon fuel tank capable of up to 200 miles between fill ups. 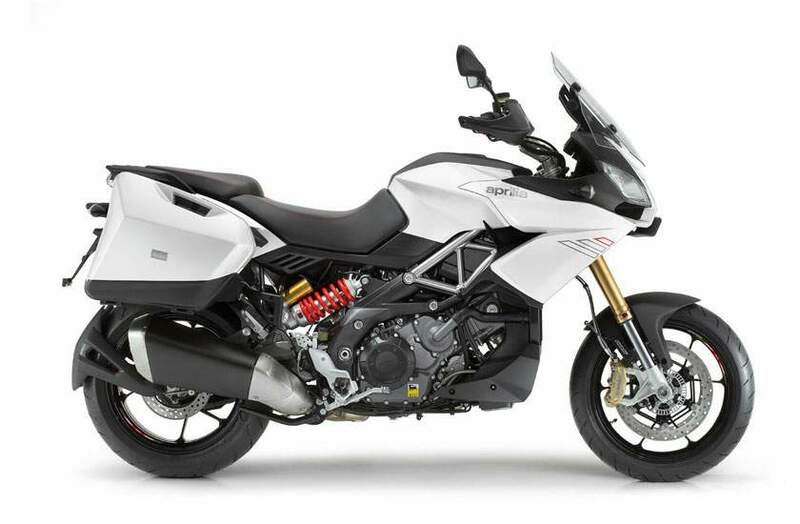 The Aprilia Caponord will be available in two colors – white or black. Aprilia has yet to release the MSRP. The Aprilia Caponord 1200 was introduced to the press on the beautiful roads of Sardinia, complimented by rain and wind. If the latest Caponord from Aprilia has been a long time coming, all we can say is good things are worth waiting for. At the heart of this new adventure tourer is the same v-twin found in the Dorsoduro we previously tested. Peak horsepower and peak torque are down just slightly in the Caponord, delivered at lower rpm levels for a broader spread of power (125 hp at 8,250 rpm and 84.4 ft./pounds at 6,800 rpm). The changes include smaller throttle bodies, and Aprilia is claiming a 20% improvement in fuel consumption compared to the Dorsoduro. As it has already done in its superbike family, Aprilia is aggressively incorporating advanced electronic controls in the new Caponord. In the upper end “Travel Pack” version we tested, in addition to ABS and traction control, Aprilia incorporates cruise control as well as ADD (which means Aprilia Dynamic Damping, rather than Attention Deficit Disorder). A description of ADD could include an article of its own. Suffice it to say that this proprietary Aprilia system controls the SACHS suspension units by sensing road conditions and riding style to make damping adjustments that best complement the given conditions. The bike’s ECU monitors numerous variables (among them throttle opening, braking, acceleration, speed and engine speed) to make the suspension adjustment assessment. Additionally, Aprilia has also incorporated a self-adjusting spring pre-load for the rear shock that reacts to the load placed on the bike by the rider, passenger and luggage. Finally, the ride-by-wire throttle response can also be adjusted by selecting one of three different maps, including Sport, Touring and Rain. Compared to the Dorsoduro, the Caponord 1200 has revised steering geometry, with reduced rake and increased trail. The wheelbase has been increased roughly 1-1/2 inches. The ABS braking system includes top drawer radial mount Brembo front calipers. The Caponord has an Aprilia family resemblance. The RSV4 superbike is brought to mind when viewing the bike from the front, and the silhouette is quite sporty for the adventure tourer class. Swinging a leg over the Caponord revealed a seat height that is tall, but not excessive for the adventure touring class (33″). The rider triangle created by the wide-set handlebars, footpegs and generous seat provided a very comfortable mount for attacking the twisty roads of Sardinia. The screen height is also adjustable, although it must be done while the bike is stationary. Wind protection is good for the class, leaving a fairly smooth air stream at helmet level. The instrument panel is thorough and legible, and assists relatively straightforward adjustment of the ignition maps, suspension damper settings, traction control settings and ABS. The Caponard 1200 with Travel Pack features the 29 liter saddlebags pictured, each of which accommodates a full-face helmet. The big 90 degree v-twin responds nicely from as little as 2,000 rpm, and vibration levels are noticeable but pleasant. Clutch action is relatively easy, and gear changes positive. A steady 70 mph yield roughly 4, 200 rpm on the tach for relaxed touring. We had all the acceleration we needed on the windy roads by rolling the throttle on between 4,000 and 6,000 rpm. Although the roads were frequently damp, we stuck primarily to the Sport and Touring ignition maps, finding less difference in the two than we expected.Throttle response was smooth enough that we preferred the more aggressive Sport setting. I also preferred the less intrusive traction control setting despite the road conditions. This is an easy bike to ride fast. The flexibility of the engine allows you to comfortably wind it on to 8,000 rpm before shifting, and the 125 hp feels more than adequate despite some of the competition reaching for superbike-like horsepower levels. The Caponord 1200 is not the lightest member of the large enduro market with a claimed dry weight of 502 pounds. Nevertheless, we were impressed by the semi-active suspension performance, and the balanced feeling of the bike. The big Caponord seemed to combine comfortable compliance with stiffer, more aggressive damping when needed for aggressive riding. Quite impressive. “Balanced” is a good word to describe the Caponord 1200. It is not the lightest or most athletic member of the category, but it combines competent handling with comfort and wind protection suitable for long distances with both a passenger and luggage aboard. The most comprehensive electronics package in the category includes an excellent cruise control feature, as well.